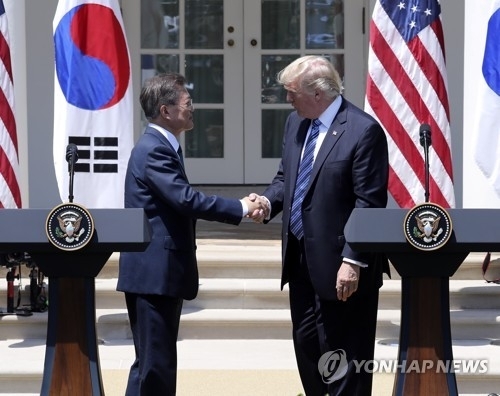 WASHINGTON, June 30 (Yonhap) -- South Korean President Moon Jae-in said Friday he and U.S. President Donald Trump agreed to a "phased and comprehensive" approach to denuclearizing North Korea, which may allow an early engagement with Pyongyang following the start of the denuclearization process. In a joint news conference after their summit at the White House, Trump reiterated the U.S. strategic patience is over with the "reckless and brutal regime," warning of a determined response to its nuclear and missile threats. "The most serious challenge facing South Korea and the United States is North Korea's nuclear and missile threats. President Trump and I agreed to work closely to coordinate our related measures while placing the top priority on the resolution of the North Korean nuclear issue," Moon said. "To this end, we, two heads of state, reached a consensus on the need to fundamentally resolve the North Korean nuclear issue based on a phased and comprehensive approach using sanctions and dialogue," he added. The new approach, if employed, may indicate a concession from the new U.S. leader, who has advocated a resumption of dialogue with North Korea only after the communist state denuclearized. Moon, on the other hand, has stressed a need to engage with North Korea as quickly as possible if certain conditions have been met. "I believe (the North) must at least promise to a nuclear freeze for us to start taking serious measures (discussions) for its denuclearization. In that sense, its nuclear freeze will be the entrance and nuclear dismantlement the exit," he told reporters while on his way to Washington aboard his Air Force One. The joint press conference at the White House followed bilateral talks between Moon and his U.S. counterpart, who too vowed to take stepped-up efforts to rid North Korea of its nuclear weapons. "The U.S. calls on the regional powers and all responsible nations to join us (in) implementing sanctions and demanding that the North Korean regime choose a better path -- and do it quickly -- and a different future for its long suffering people," Trump told the joint press conference. "The North Korean dictatorship has no regard for the safety and security of its people or its neighbors and has no respect for human life -- and that's been proven over and over again," Trump said. "We are working closely with South Korea and Japan as well as partners around the world on a range of diplomatic, security and economic measures to protect our allies and our own citizens from this menace known as North Korea," he added. Moon thanked his U.S. counterpart for his "firm determination to resolve the North Korean nuclear issue and establish lasting peace on the Korean Peninsula." The South Korean president also emphasized the importance of the Korea-U.S. alliance in dealing with the provocative North. "There are now deep trust and friendship between President Trump and I, and I believe they will provide a strong basis in tackling many problems in the future," Moon said. Trump agreed, calling the alliance a "cornerstone of peace and security in a very, very dangerous part of the world." Still, he repeated his call for Seoul to shoulder a greater burden in maintaining 28,500 U.S. troops in South Korea as part of U.S. deterrence against North Korea. "As part of that commitment, we are working together to ensure fair burden-sharing in support of the United States military presence in South Korea. Burden-sharing is a very important factor, a factor that's becoming more and more prevalent, certainly in this administration," Trump said. Moon's visit to the U.S., his first overseas trip as president, followed five missile tests staged by North Korea since his inauguration last month. Moon said he and Trump have agreed that only strong defense can enable true and lasting peace. "(We) agreed to strengthen our overwhelming deterrence through the joint defense posture of South Korea and the United States, including our nonproliferation efforts. We agreed to firmly counter North Korean threats and provocations," he said. The leaders also agreed to boost their countries' cooperation in dealing with global issues. "We agreed to expand and develop the Korea-U.S. alliance into a global partnership while jointly dealing with global challenges such as terrorism," the South Korean president said. Moon said he invited Trump to visit his country within the year. The U.S. president accepted the invitation, he said. The two are already set to meet again on the sidelines of the upcoming G20 summit in Hamburg, Germany, for three-way talks that will also involve Japanese Prime Minister Shinzo Abe. The two-day G20 summit will begin July 7, with the three-way meeting of the South Korean, Japanese and U.S. leaders set to be held on its eve.